Although I think there might be problems with thermal range. 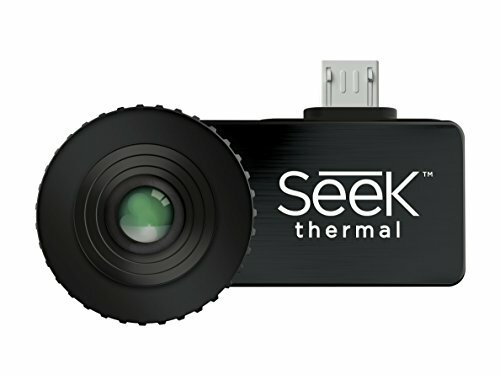 The Seek only really sees up to 600 degrees Fahrenheit and the sensor sorta blows out above that. I think I damaged mine using it to look at a blowtorch flame. How does the damage manifest? Is there a way to correct or prevent this? When I think I broke it, the whole sensor whited-out, and didn’t regain sensitivity until I put the camera in the fridge overnight. So maybe the bolometer just couldn’t get the heat out sufficiently? Couldn’t keep itself cool enough? It seems to create fuzzier images now too. But they were very fuzzy to begin with. I have to get something like this. Note to self: make a spatial sensitivity calibrator, take pictures over time to assess sensor degradation. It’s very cheap as far and mid infrared imaging goes. About 1/8th the cost of the cheapest FLIR brand thermal monocular. Today I woke up to a frosty windshield in SW Ontario. Presumably that was frost on the outside though, correct? Moisture inside the cabin makes little difference there. Correct. The frost was on the outside of my windshield. Cold Canadian temperatures generally reduce the amount of moisture inside the cabin which means cracking a window to allow moisture to exit the cabin will not help defrost my Canadian windshield any faster. First, I don’t have a garage, so let’s not make the assumption that all “life-hackers” have that luxury. Secondly, why would I homebrew isopropyl/water spray when my car has built-in isopropyl/water sprayers located adjacent to the windshield? Ultimately, using a “science-backed method”, I’d hypothesize that I can “defrost” the outside of my “windshield in half the time” using a conventional scraper. The frost was on the outside of my windshield. Cold Canadian temperatures generally reduce the amount of moisture inside the cabin which means cracking a window to allow moisture to exit the cabin will not help defrost my Canadian windshield any faster. The problem here seems to be that the headline of the post talks about defrosting, but the actual video is talking about defogging. And we have mixed conversations in this thread about both. That truck is over-engineered to the point it becomes ultimately self defeating. only a few steps away from self-aware! If you have a rock chip, hot water is a great way to turn it into a full-blown crack. No molten nickel needed.